Building an outdoor chess set requires the use of power tools and a large workspace. You can purchase lawn chess sets for approximately $400, but building your own set costs only a fraction of the commercial price. Chessboards can be made of wood or created on a painter's canvas. Paint the parts to make the chess pieces in desired colors--half of the set one color, the second half another color. Allow to dry before assembling. Lay painter's canvas on a flat surface. Use yardstick to measure 18 rows of squares onto canvas or board. Paint squares in two separate colors in chessboard fashion. Dry the lawn chessboard overnight. Apply clear coat of polyurethane to chessboard; let dry overnight. Apply two coats on each side if using painter's canvas. Create 16 chess pawns. Attach 1-inch candle cups to doll pin stand with nails or hot glue. Attach 1-inch cube and wood head bead to pawn with hot glue or nails. Make four rooks. Attach the 4 1/2-inch milk cans to a 2-inch candle cup. Attach a wood head bead and upside-down 4 1/2-inch candle cup to chess piece base. Add an additional 41/2-inch right-side-up candle cup and wood ball with hot glue or nails. Build four chess castle pieces. Attach a 3-inch milk can with lid to 2-inch wood cube with hot glue or nails. Add 1-inch cube to each side of the attached 2-inch wood cube. Attach wood ball to the top of the chess pieces with hot glue or nails. Create four chess knight pieces. Connect 2-inch candle cups to the candlesticks with hot glue or nail. Attach a 2-inch candle cup and upside-down 1-inch candle cup to knight base with hot glue or nails. Attach a wood ball to the top of the piece with glue or nails. Build two chess king pieces. Attach a 2-inch candle cup to a spool with glue or nails. Add a wood knob and an upside-down 1-inch candle cup with glue or nails. Add a wood bead head, then another 1-inch candle cup, and a wood ball with glue or nails. 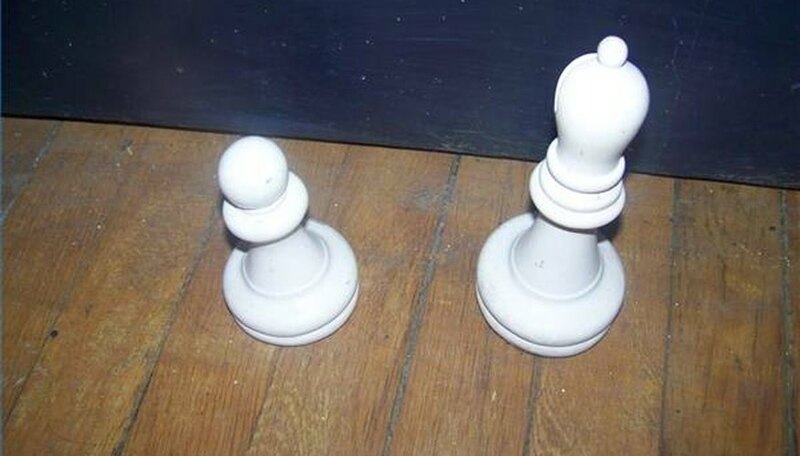 Make two chess queen pieces. Attach a 2-inch candle cup to a wooden spool or barrel piece with hot glue or nails. Add a wooden bead head, doll pin stand, another bead head, 1-inch candle cup and a wood ball with hot glue or nails. Spray or paint on clear coat. Let chess pieces dry overnight.